I love salads which are interesting. By interesting I mean an unusual mixture of different flavours and textures which, once you taste them in combination, simply belong together. 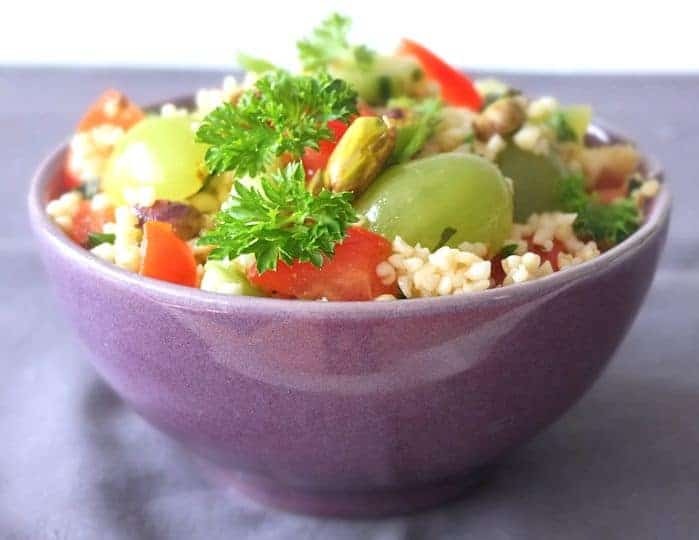 This is how I feel about this Bulgur Salad with Grapes and Pistachios. 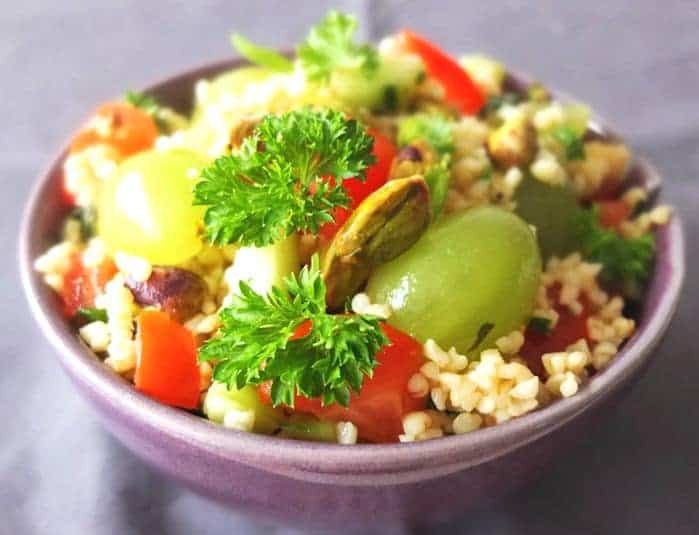 It is another variation of the famous Lebanese Tabbouleh recipe. 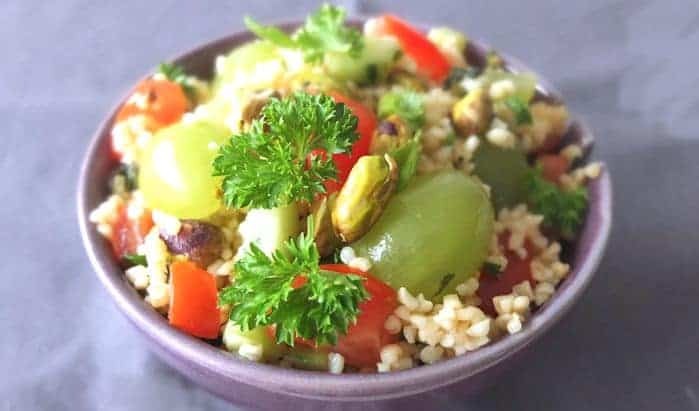 The sweetness grapes have a different crunch than the pistachios and bring some freshness to this salad. I prepared this recipe the night before and we ate it on a hot Saturday Summer afternoon as light lunch. For our protein I made some Chicken marinaded in Lime and Mint which went really well. Heat a pot of water and add the bulgur wheat. Cook for about 15- to 20 minutes until soft. Then place in sieve and leave to drain. 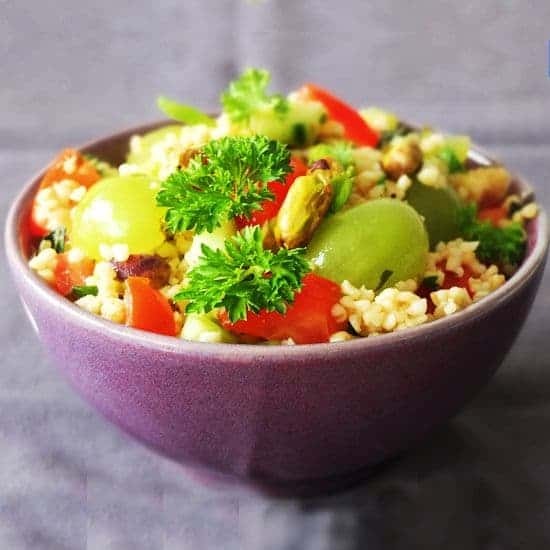 In a large bowl mix together the tomatoes, cucumber, grapes and garlic. Now add the bulgur and mix well. Add some salt and pepper to taste and add some olive oil and the lemon juice. Finally add the parsley and mint. Tastes better if you leave it in the fridge for a couple of hours for the flavours to infuse. Before serving add the pistachios.